It’s been a very long couple days, what with being sick, and also having two performances to get through. This whatever-it-is hit me on Wednesday, and the worst was, thankfully, Thursday, but still, I sang the concerts through the power of cough drops and magic (although at least one bonus of being sick when one is already a low Alto, is that one can then sing the low notes with *way* more power, so….yay? ), and pretty much tried to rest and recuperate at home when I wasn’t singing. Ah, fun times. Today, however, was the last day of Stitches West, and I had a couple really good reasons for wanting to go this year. When I woke up this morning I felt like the worst was over (except for some residual hoarseness of the voice), so I bundled up all my stuff for the day and drove down to Santa Clara and spent the whole day there, hanging out with lots of friendly knitters and surrounded by so much yarn. I kept my willpower firmly in check and only bought one skein of yarn (in my defense, it’s a gorgeous shade of purple, and was only $16.50 for 1000 yards of a bamboo-cotton blend laceweight. I am not made of stone, people!). I hung out at the Lacey Knitters Guild booth and got to chat with a number of fellow guild members, some of whom I only get to see once a year. I got to finally meet in person the awesome lady at Knit Picks with whom I’ve been working for the past six years, and I also got to finally meet in person someone I’ve known via an online community for probably close to 15 years. I had grand plans for dinner tonight, as it’s Clam Chowder Day. But by the time I got home, my head was killing me, and I couldn’t handle the thought of trying to put *anything* together. 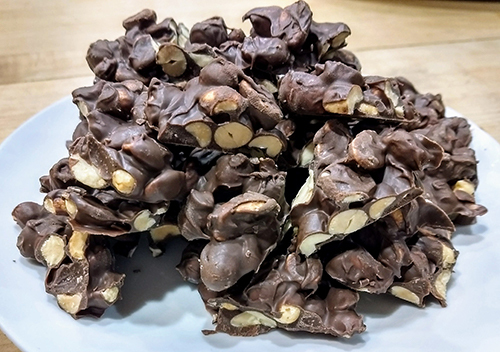 So instead I dosed myself with ibuprofin and Richard ordered pizza, and later on, after I’d started to feel a bit more human, I made Chocolate Covered Peanuts. Because today is also Chocolate Covered Peanut Day. There is no specific recipe for this. Basically I took the remains of a bag of chocolate chips and the remains of a bag of butterscotch chips and dumped them into a bowl and heated that in the microwave until they were all melted. And then I dumped in the remains of a jar of peanuts and stirred those around until they were all well-coated, and I poured it out onto a sheet of waxed paper and stuck that in the fridge to chill. After about an hour or so – I wasn’t really timing it – they were firm enough, so I broke the whole mess apart into chunks, and voila, chocolate-covered peanuts. Ta da. Or something. I dunno. They’re chocolate covered peanuts. What more is there to say?